Bohol Has More Than Just Chocolate Hills -- 6 Other Tourist Attractions Worth Checking Out! Talk about Bohol and the Chocolate Hills first comes to mind. But this island province located in the Central Visayas has more than just these unique grass-covered hills. It is also a great place for island hopping, river cruising, caving, sightseeing, and many more. #1 - Panglao Island: With its white sand beaches, cool crystal blue waters, exceptional dive sites, and tranquil ambiance, this island easily became a favorite destination for both local and foreign tourists. Mostly associated with it is the Alona Beach, a stretch of white-sand beach with many hotels, resorts, restaurants, and bars. 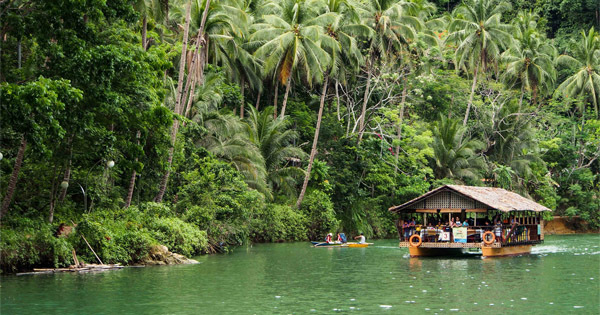 #2 - Loboc River and Floating Restaurants: Bask in the breathtaking scenery of lush green forest surrounding the clean and calm Loboc river while cruising in a native floating restaurant. Be serenaded with the great music of the band and singers aboard while enjoying the good food from their lunch buffet. #3 - Danao Adventure Park: Test your limits in this extreme, educational, and eco-adventure park that adventure seekers should not miss. There are lots of extreme activities that can be done here including the plunge, wall climbing, sky ride, etc. Besides that, it is also perfect for leisurely travel as there are also activities such as bird watching, kayaking or just sightseeing the wonderful nature. #4 - Hinagdanan Cave: Enter a new world in this cave located in Panglao Island. It's pretty easy to enter the cave with "hagdan" or stairs from the entrance. Moreover, natural light illuminates the cave through holes creating majestic optical effects. The lagoon inside the cave is quite inviting for a dip but it is advised not to swim because of the karst pollutants in the water. #5 - Man-made Mahogany Forest: Take a stop and feel the fresh air in this two-kilometer stretch of densely planted area of mahogany trees along the road of Loboc and Bilar and on the way to/from the Chocolate Hills. This is the first and only man-made forest in the Philippines which is planted by the students of Holy Name University many years ago. #6 - Philippine Tarsier and Wildlife Sanctuary: No, we did not forget our cute little tarsiers in Bohol. This world's smallest primate can be found particularly in this sanctuary that aims to conserve and preserve the habitat of the tarsiers. They are quite sensitive so tourists are not allowed to touch them and take pictures with camera flash on.